Why do so many historians work on Europe and North America? How much do students know about the wider world? How can we encourage a broader range of historical research? This site provides information about the first detailed study of the geographical range of historical research done in American, Canadian and British universities. Our findings were published in May 2013 in the American Historical Association’s Perspectives magazine, and discussed by a number of scholars - including Kenneth Pomeranz and Mary Elizabeth Berry - in a subsequent Perspectives forum, which you can read here. You can also read a short summary of our findings at the ActiveHistory.ca website. On Wednesday 11th September 2013, we held a roundtable discussion at the Institute of Historical Research in London on the geographical range of history research and teaching -- featuring contributions from Nicola Sheldon, Jason Todd, Richard J. Evans, Su Lin Lewis and Machel Bogues. The event was supported by the IHR, the Higher Education Academy and the University of York History Department. The IHR has kindly archived the event here. We have been resting on our laurels of late, but we very much enjoy hearing from colleagues who are interested in this topic. (Especially if you have ideas about how we can take forward the issues we’ve highlighted here.) Please do send us an email via the ‘Contact’ tab above. 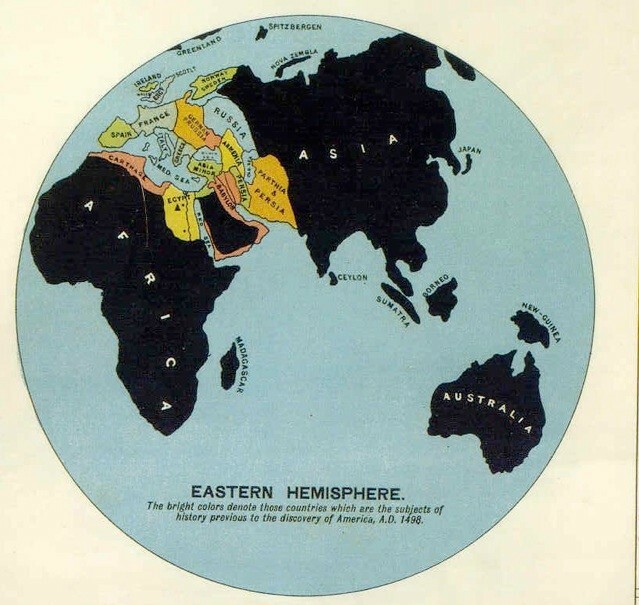 The geologist Edward Hull's "Synchronological Chart of Universal History" (1890) features a world map on which "bright colors denote those countries which are the subjects of history previous to the discovery of America." Europe, North Africa, and West Asia—cradles of western civilization—shine brightly. An inky black drowns the rest of the hemisphere (including a single-island Japan shrunk down 75% to the size of Ireland), and the Americas beyond the fringe of Greenland do not appear at all.